Come on over to the Pals Paper Arts Challenge Blog and play along with us this week. 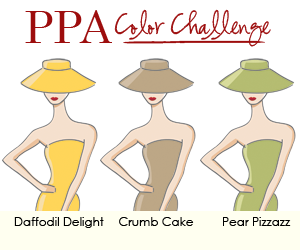 Our Color Challenge Celebrity Guest is Veronica McCollum. Not only does Veronica stamp cards, she also designs blogs! We are honored to have her as our guest this week. Color Challenges can be difficult. This one was easy mostly because the weather here seems to match the colors this week! I loved playing with this combination. To start, I knew I wanted to use Watercolor Paper from Stampin' Up (105019 $6.95), so I chose a fun image from Birthday Bakery (hostess) and stamped it onto the paper. I used my Stampin' Write markers in Daffodil Delight, Crumb Cake and Pear Pizzazz. It's easy when you use the watercolor paper because it doesn't pill like regular card stock even when you color on a second coat. I used the Daffodil Delight card stock to frame my watercolor, then framed it again using a 3" x 3" square of Pear Pizzazz and turning and centering the card stock four times in my Scallop Trim Border punch (118402 $15.95). I mounted my work of art onto a piece of Daffodil Delight card stock that I ran through my Big Shot in a Perfect Polka Dots (117335 $7.95) embossing folder. Underneath my art, I framed this week's colors of Flower Brads with coordinating 1/2" and 3/4" punched circles. I hope you enjoy my creation and that you will play along! When you are in need of Stampin' Up! products, please use my website any time. Wonderful frame - really sets off your image! Sweet sweet birthday card! I LOVE the frame, Patti! The dotted texture is the perfect background! Adorable image! CUTE card! Love the frame and display of flower brads! CUTE! Love the flower brads.